Declawed: The hospital will now use simulators, which some say are not as effective for training. On Feb. 9, Primary Children’s Medical Center canceled a scheduled training for flight nurses involving intubation of cats—used as proxies for infant children. The cancellation came midway through a series of actions People for the Ethical Treatment of Animals (PETA) had planned to compel the hospital to end the practice. Intubation is inserting a tube or device down a patient’s throat to feed oxygen to the lungs. The training for flight nurses involving live cats was just one session in an overall conference. Jeremy Beckham of PETA says using cats as a proxy for human children is old-fashioned and falling out of favor. He claims that lifelike simulators designed for intubation training are not only superior for training medical practitioners but also are widely used in training programs across the country. Primary Children’s uses both. Ed Clark, the hospital’s chief medical officer, agrees that simulators are valuable and, he says, the hospital has spent $1.5 million purchasing and building a simulator-training facility. The cats are used for flight nurse training in particular because of the special need for those nurses to have the most top-notch training, which he believes comes from intubating cats. 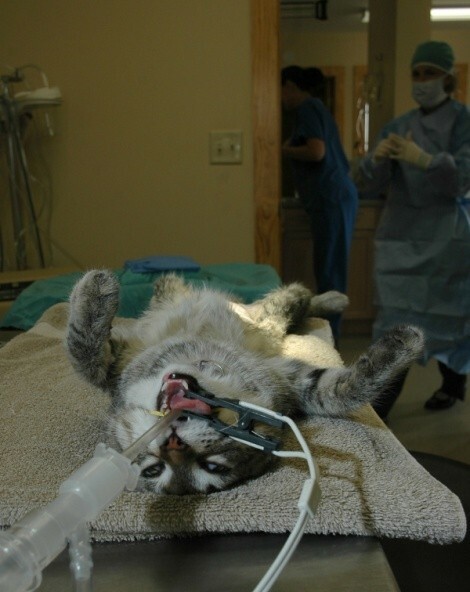 Clark says he’s unaware, however, of any medical research that supports or contradicts the claim that practicing intubation on a cat is better preparation than using simulators. PETA points to a 2009 article in the Journal of Emergency Nursing in which a flight nurse and flight medical team educator who helped develop the Pediatric Advance Life Support training program was “mortified” to discover that some hospitals were using animals as a part of the PALS course. That’s true, says PETA’s Justin Goodman, associate director of laboratory investigations, but he believes most organizations relevant to the debate have already issued their opinions against using cats for the training. “Simulators, not animals, are the training standard for flight nurses in the Air and Surface Transport Nurses Association’s ... advanced trauma course. And the Emergency Nurse’s Association certification for flight nurses does not require or recommend that any animal-based training be completed,” Goodman says. The two sides starkly disagree on how invasive the procedure is for the cats. “The reason we have to train professionals is if you make a mistake, you can cause internal bleeding, swelling and death. Our information suggests some cats in this are killed, so it’s not a light procedure,” Beckham says. On Feb. 7, activists delivered a vegan cake to Primary Children’s CEO Joe Mott, asking him to cancel the training session. Following that local lead-in, PETA urged 25,000 activists to make phone calls, write e-mails and messages on Primary Children’s Facebook wall. The hospital temporarily shut down postings to their Facebook wall during the action. Midget says some of those messages, however, were posted in response to wall postings of past patients, who wrote about good experiences with the hospital. “They were posting to those patients’ families’ posts information that their child care was provided by ‘people who mutilate and torture animals,’ which just isn’t true,” Midget says. That was “inexcusable,” she says. Their decision to probably end the use of cats in future trainings was not based on the PETA actions, Clark says, but in a roundabout way, PETA was probably partially responsible—along with the Utah Legislature. Clark says cats for the training could not be obtained at a reasonable price and speculates some responsibility for those high prices goes to 2010’s House Bill 107, sponsored by Salt Lake City Democrat Rep. Jennifer Seelig and co-sponsored by Provo Republican Sen. Curtis Bramble. That bill removed the obligation for Utah animal shelters to sell their animals to research laboratories but allowed the shelters to continue doing so at their discretion. That bill passed in the wake of controversy and news coverage created by PETA’s undercover investigation of animal labs at the University of Utah. According to PETA, all of Utah’s shelters have chosen to end the practice except Northern Utah Valley Animal Shelter, or NUVAS, in Lindon.